Yesterday's run felt so effortless that I wasn't ready to stop when we reached the end. Business took priority over pleasure but I did feel great for the remainder of the work day. The run itself was work and I felt the effect of all those hills this morning when I woke up. Still, I was anxious to get out for another run. My wife and kids were volunteering at my son's elementary school all morning. I had nothing on the calendar until after lunch so I headed out for my run around 9:00 AM with temperatures in the the high 30's under overcast skies. My Garmin was fairly quiet so I knew I was within pace range although a check of the display showed my pace to be a little slower than it seemed. I stepped it up after the first mile and would periodically surge for 30 seconds to a minute before falling back to my default pace. I was running faster than yesterday's city excursion and I felt the difference. All the same I didn't feel that I was working that hard and the data from my heart rate monitor confirmed it. I felt like I had covered a lot of ground but I ended up only going a little more than four miles. It was just far enough to count as a good workout. When I finished the run I checked my Garmin and saw it displayed 4.07 miles, averaging 9:10. 9:10 isn't a bad pace and I figured that yesterday's run had wore me out more than I'd thought. I then mapped the exact route using Gmaps and saw that the Garmin under-counted the distance by 2.3%. Adjusting my pace for that variance, my overall average was under 9:00 (8:57) and my splits were 8:54, 8:57, 9:03 and 8:59. Love the FR60! I'm going to try to calibrate it a little closer so I don't have to do so much math. I haven't messed with the calibration adjustment on the FR60 yet. The default accuracy is +/- 3%. It wasn't all that easy to adjust the 50 so I'm hoping the 60's controls are better. 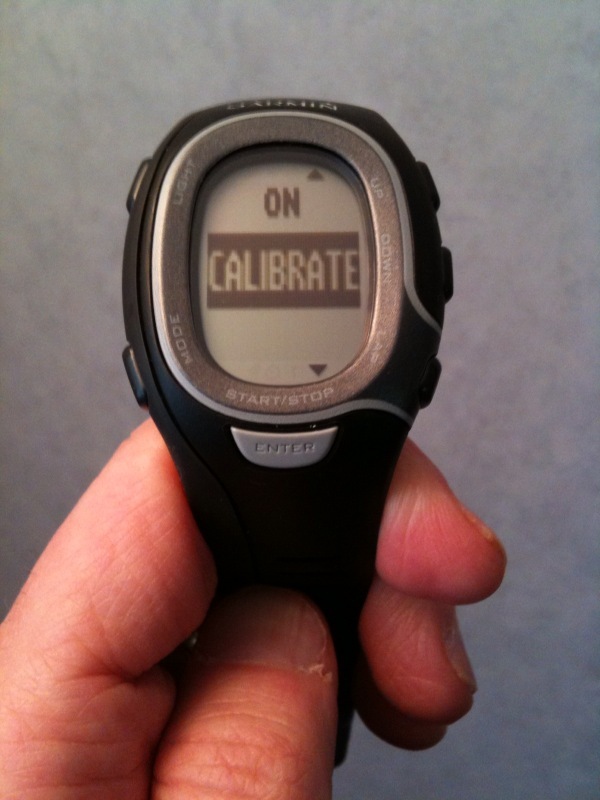 My problem with calibration is that I switch my foot pod often between my pairs of street and trail running shoes and every change affects the calibration accuracy. Overall, I'm happy with my recent runs and glad that I've made my way down to the low 9:00's that I was running prior to my pneumonia disruption. I don't know what I'll run tomorrow. The skies are looking ominous but I'm hoping that this passes and that the trails are in good shape by Sunday.